A small business owned by a service connected disabled veteran. Noise - How Quiet ? Largest online selection of GeneratorJoe mobile diesel single phase and/or three phase Rental Grade generators. Commonly called rental generators with multiple voltages. 20,000 watts (20 kW) to 500,000 watts (500 kW). Engines from Cummings, Isuzu & Perkins. We have high quality generators at a competitive price and with the longest warranty in the industry. No foreign parts. Made in the USA by Americans! This website and its contents are Copyright ©1996-2019 GeneratorJoe Inc. & GeneratorJoe® - All Rights Reserved - Selling quality generators since 1996. Content, graphics, photos and HTML code are protected by United States and International Copyright Laws and may not be used, copied, reprinted, published, translated, hosted or otherwise distributed by any means without explicit written permission of GeneratorJoe Inc. Materials, information, trademarks and copyrights from other companies are the property of the respective owners. 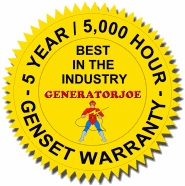 GeneratorJoe®, GeneratorJoes™, Generator-Joe™, PowerPixie™, Power Pixie™, GeneratorPro™, GeneratorPros™, Generator Professional™ are trade names and trademarks of GeneratorJoe Inc. The following generator related trade marks and copyrights are in use by GeneratorJoe Inc. and are protected by U.S. and International Copyright laws: In addition, Admiral™, Cavalryman™, Captain™, Centurion "C"™, Centurion "D"™, Centurion "I"™, Centurion "IV"™, Centurion "J"™, Centurion "K"™, Centurion "M"™, Centurion "P"™, Centurion "PM"™, Centurion "SM"™, Centurion "SP"™, Centurion "SY"™, Centurion "Y"™, Champion™, Commander™, Contender™, Defender™, Defender2™, Excalibur™, Gladiator™, Infantryman™, Knight™, Lieutenant™, Legionnaire™, Mariner "J"™, Mariner "Y"™, Mobile Power™, OmniFuel™, OmniPower™, Patriot™, Protector™, Rental Power™, Residential Defender™, Sergeant™, Soldier™, Storm™, Trooper™, Trooper Trailer™, Vanquisher™, Vigilant™ and Warrior™. Other trademarks may appear on our website or in our publications and are also protected by United States Copyright Laws.